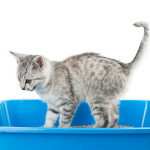 Your cat stopped using the litter box — Now What??? Help! My cat stopped using the litter box! Cats are fastidious creatures so it comes as a surprise to people that little Pickles is indulging in urinating or defecating outside the litter box. This undesirable behavior is difficult for people to deal with, particularly if she is using the flower pots, bed or the sofa as her toilet. Yet, this is a common problem with indoor cats, particularly in multiple cat households. In fact, it is so common that we have coined a name for this behavior: Multiple Indoor Situational Stress Elimination Dysfunction or M.I.S.S.E.D. As the name denotes, this behavior is due to environmental stress and frequently occurs in homes with multiple indoor cats. However, it can also occur in homes with a single cat. First things first, we can not emphasize this enough, before you make any decision about giving this cat up PLEASE have her/him checked out by your veterinarian. When a cat suddenly breaks the cat box habit there is often a medical cause. Although we have encouraged cat owners to follow through with a visit to their vet, many choose not to. Instead, they prefer to think that kitty is “angry” at them or “getting even” with them. Many of them give up on the behavior and instead bring the cat to a shelter (where it’s often euthanized) or they make the cat stay outside, decreasing their lifespan and adding more stress to the cat’s life. Please be assured that your cat is NOT angry at you — cats do not have the ability to think in these abstract terms. They are creatures of the moment, they are reactive, they do not harbor resentments or hold grudges. It may APPEAR as if they do—but in reality what they are reacting to is YOUR emotions. OR they are reacting to their OWN momentary emotion. Some physical illnesses may mimic behavior problems. One is Feline Urologic Syndrome (FUS). Both male and female cats are affected by this but male cats are particularly prone to urethral obstruction (due to their narrower urethra) than females. FUS occurs when crystals and small stones form in the bladder. These will nick and cut the linings of the urethra and bladder creating inflammation and pain. As these structures travel from the bladder through the urethra they can be caught in the male’s narrow urethra, creating an obstruction. This is a serious medical condition that requires immediate medical attention because obstruction can lead to kidney failure and death. Cats with FUS will often indulge in continual licking or grooming of the area around the urethral opening. Due to pain and a constant full-bladder feeling, inappropriate elimination can occur. Some cats resort to urinating in the bathtub, the sink, the bed, or on the sofa. Some cats will vocalize their pain when straining to urinate. Others will simply “shut down” preferring instead to hide and avoid human contact. On the opposite side of the spectrum is hypothyroidism (a decrease in thyroid gland hormone). Hypothyroidism increases thirst and appetite. Again, this is accompanied with more urine output. However, instead of losing weight the cat gains weight and those extra ounces (or pounds) will often cause litter box problems. Furthermore, this condition leads to a lethargic cat who appears depressed. Hypothyroidism is often seen in older cats, so if your senior feline is experiencing these symptoms get her over to the vet for some tests. Both hypo and hyperthyroidism are treatable. In sum, physical problems can be misinterpreted by humans as “behavior” issues. So, if your sweet little Pickles suddenly turns sour consider it a blessing in disguise, she might be telling you something. On the other hand, if Pickles received a clean bill of health from the veterinarian yet still persists in using furnishings, flower pots, or floors as a cat box the following check list might unearth the problem. Please keep in mind that these questions are not listed in order of importance. 1. Have you recently changed cat litter products? A change in litter can create cat box aversion. Why? Because your cat is comfortable with the old brand and this new stuff smells and feels different. If you plan on switching cat litter do it a little at time: Place a small amount of the new brand in a clean cat box then top it off with a thick layer of the familiar litter. As Pickles uses the box the two brands will get mixed. Just keep adding more of the new litter and topping it off with less and less of the familiar brand. Pickles will adjust within 7 days, if not sooner. 2. Have you recently moved the cat box? Cats simply will not tolerate switching cat box locations unless it is done gradually. Why? Well, think of it this way: if someone suddenly locked the bathroom door on you and didn’t tell you where the new bathroom was, what would you do? “Ah!” you say, “But a cat should be able to smell his way to the new location.” Not necessarily. Sure, cats have a keen sense of smell but they also have a stubborn sense of habit. If you need to change the location of the box, do so gradually. Move the box a few feet daily until it ends up in its new spot. Pickles will be much happier for it and so will you! 3. 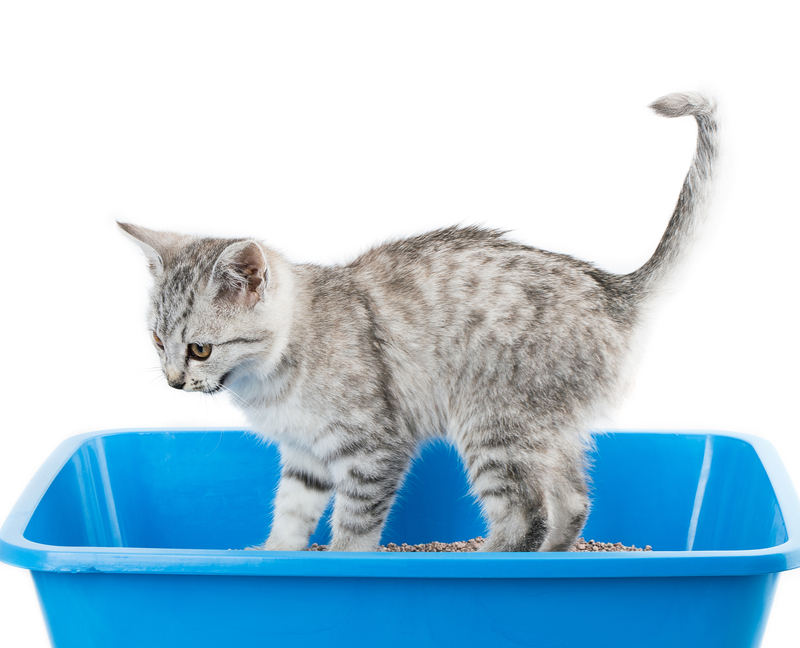 Have you recently changed the type of litter box you are using? Cats prefer the open box variety to a covered box. A lidded box might be a great gimmick for you, to a cat it looks suspicious. Their nature is to avoid being enclosed. Observe the bathroom habits of the outdoor feline, they go where and when they feel like it. They do not look for a place that provides them “privacy” and enclosed areas are avoided. The idea that cats need privacy is strictly a man-made one. Try removing the cover and see if that helps. Also, is the litter box the correct size for your kitty? 4. How many litter boxes have you provided for your cat/s? The rule of thumb is to provide each cat one box of its own plus one. Why? Well, strangely enough cats sometimes prefer one box location to another depending on the type of elimination required. For example, some cats prefer to use one specific box for their bowel movements. This might appear strange but if you think about it some people are the same with their toilet habits! This one-box-plus-one rule is particularly applicable when the home is multi-storied. In which case you might consider placing a box on each level. 5. Does the cat have access to the litter box at all times? 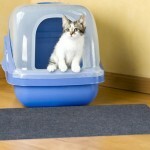 Placing a cat box in the bathroom or closet might be ideal for you. But if a person is using the bathroom the door might be closed, blocking the cat from its box. A closet door might also be inadvertently shut. And, if this box happens to be the only box in the house a cat with the “have-to-go-now” urge will have a real problem. 6. Have you recently acquired a new cat? MISSED syndrome is common in multiple indoor cat households. Cats will eventually adjust to a new housemate. But it takes time. Sharing the litter box with another feline is stressful, much the same as if you suddenly had to share your bathroom with another person. It takes some adjusting to. For one, the box could be occupied when Pickles wants to go. For another, there’s a new smell in there. Keep in mind that urinating and defecating is also a cat’s method to “mark” their territory. Added stress in multiple cat households can be avoided by simply providing multiple boxes in various locations around the home. 7. 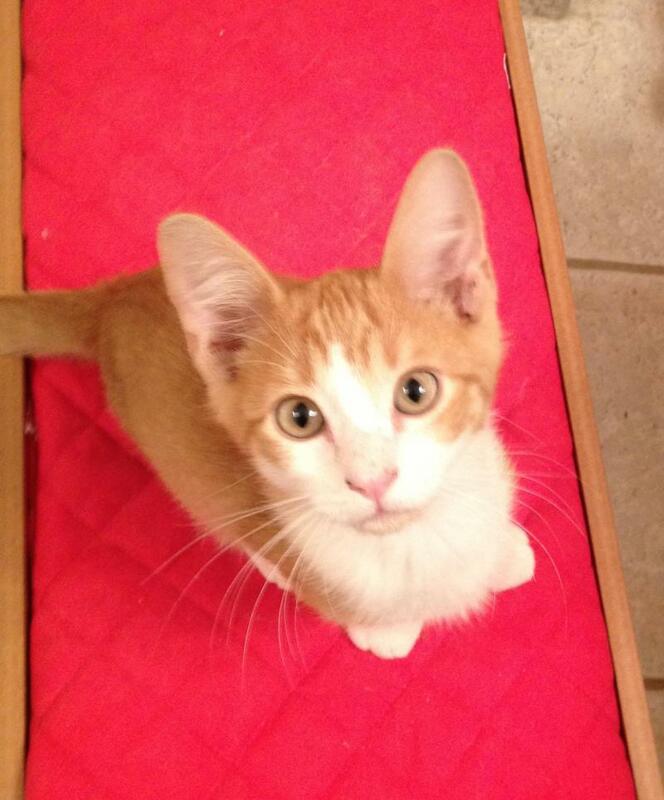 Have you recently placed a new mat in front of the litter box? In our efforts to alleviate dust tracking we purchase “litter mats.” However, some of these mats are not cat friendly. When seeking a litter trap keep the cat’s comfort in mind. Surfaces with large grates can cause a cat to feel insecure. Other mats appear to resemble outdoor carpeting, with brittle plastic “fibers” that can poke into a cat’s paw pads. Still others may have the annoying habit of slipping on hardwood floors, a feature not appreciated by the feline. Litter mats need to be soft, pliable, and secure feeling. A grated mat is fine, as long as the grates are small enough for the cat not to notice. A “carpet” type of mat is also fine as long as it doesn’t poke into the cat’s paws. 8. Have you recently moved? This question opens up a myriad of problems since cats by far prefer to keep things unchanged. Yet, in today’s frenetic world change will occur despite the cat’ s wishes. You can help Pickles acclimate to her new space by placing her in a small room with her box and food and plenty of hiding places. When she becomes comfortable with this new space let her out to explore her new surroundings, a little at a time. One word of caution, do not try to “comfort” Pickles when she acts nervous and afraid. Instead, adopt a calm demeanor and whenever she is doing something positive, such as eating or looking out the window, take that opportunity to pet her. Your own attitude about the move will greatly affect the cat so make certain that you feel happy about it and try to convey that to her in your outward expressions. 9. 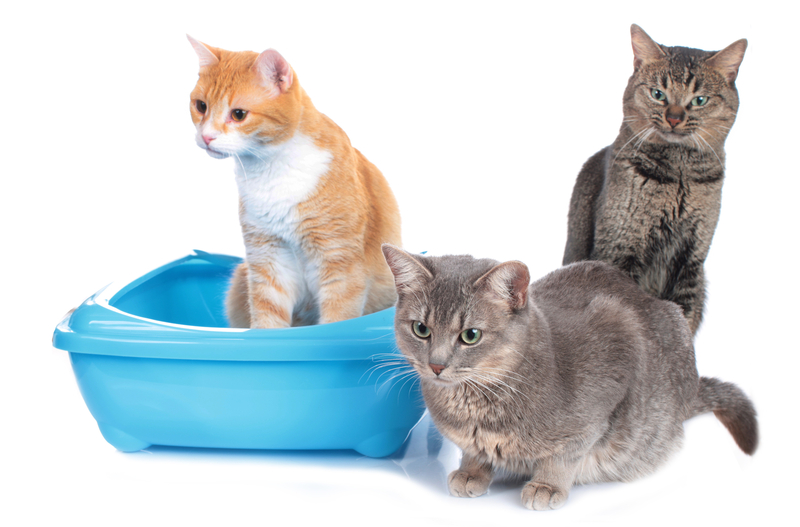 Have you recently placed an “air freshener” near the litter box? A nice smelling home is something that people strive for, not cats. Their noses are very sensitive and foreign odors can create confusion. The MISSED syndrome will often show up if an owner places a plug-in air freshener or some other perfumed device near the cat box. So avoid this practice. 10. 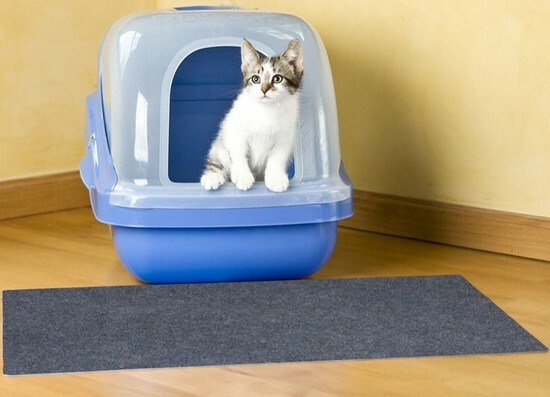 Have you recently added a litter pan liner to your cat box? Simply put, cats do not like smooth, slick surfaces. While kitty box liners are fine for humans they are nor appreciated by the feline. Why? It changes the feel and texture of the litter since the plastic bag is often pulled up, dislodged or wrinkled by the cat’s digging. The result is an unpleasant experience that can result in cat box aversion. 11. Have you recently added “litter freshener” to the cat litter? Covering up stinky cat box odors is a common practice among cat owners. However, if you have never done this before the new smell in the box could create cat box aversion. Even if you have used these products before your cat may suddenly decide she doesn’t like it. 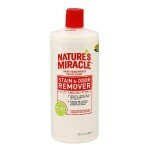 Instead of adding perfumed products or even baking soda to the box try scooping more often or adding additional boxes. 12. How often do you scoop the box? We live busy lives and scooping might not be our priority. But it needs to be. The outdoor cat has a wide bathroom selection, the indoor cat does not. She is stuck with what you provide. To reduce odors and encourage proper elimination it is suggested that the cat box be scooped a minimum of two times a day. (It is of course better if it is scooped more often.) Some cat owners do not scoop at all, instead they dump the whole mess out once a week, scrub out the box, refill it with clean litter and call it done. This is not conducive to good feline toilet habits. Why? Well, let’s contrast a fully-loaded cat box to our own toilet habits. Let’s face it, when you go out to a restaurant or a ballgame you want access to a clean toilet. What happens when you open up the stall door and see a toilet that hasn’t been flushed all day? More than likely you will seek a clean stall. And so it is with the cat, only she doesn’t have another stall to choose from. So pick up the scoop and start scooping! You’ll have a cleaner, more sanitary house (remember kitty gets on the bed, the sofa, and the surfaces of your home) and both of you will be happy. 13. Have you recently changed your routine? If your routine has altered this could affect your cat’s emotional state. 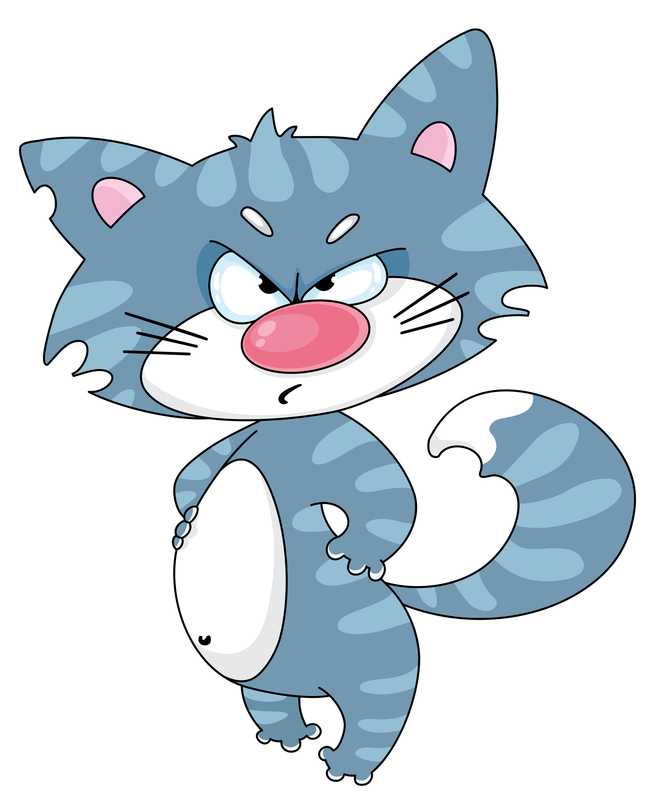 Often when cats become anxious they express themselves in inappropriate ways such as yowling or resorting to urinating in other areas of the house. 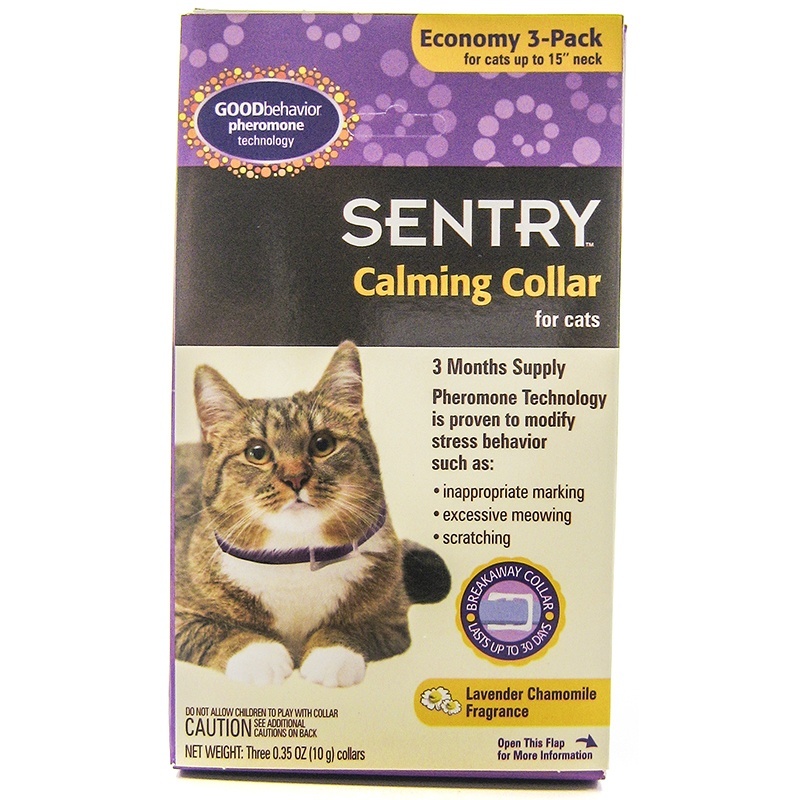 This is NOT a “get even” action, so please do not put that human emotion on your cat. Instead it is an outward expression of an inward turmoil. 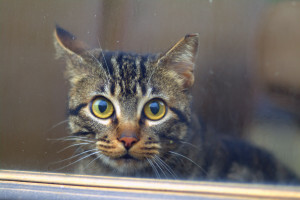 Consider it this way, your indoor cat is trapped in its environment, it can’t get in the car to “get away from it all,” nor can it take a vacation or have a group therapy session. Instead its reactions are purely primordial: an increase in adrenal causes all bodily functions to speed up, including the bladder and the bowels. (This also applies to humans.) Consider the fact that the cat is not only pumping extra adrenaline into its system but it also has an instinctual urge to react to this physiological change by marking out a defined territorial barrier. Why? Because this is an animal’s method of preventing other animals from encroaching into its area. In this case, the cat’s actions are a defense mechanism. The best way to handle this is by using feline pheromone products, such as a Feliway plug in diffuser, that will produce a relaxed state of mind. 14. Have you recently added a new member to the household? This falls under the heading of changing your routine so please see number 12 and also number 13 for the possible solution. If a new baby is added to the home follow the instructions for out of town visitors (Number 15) until the baby’s scent is established in the home, that will only take a few weeks. The same applies to any other new household members. 15. Have you had visitors from out of town? This also falls under the heading of changing your routine with a few unexpected twists. Visitors bring with them excitement, strange smells, and different voices. They also bring into the home a new energy level. That is, the normally quiet atmosphere may become chaotic. The opposite may also occur. A chaotic household may become quiet because the family is out more often. Either way, the cat could react negatively. One common reaction to visitors is the cat’s penchant for urinating in your visitor’s suitcase. It is an annoying occurrence, frequently followed by ruined clothes and voluminous apologies from embarrassed hosts. Is the cat defiantly stating his resentment of the visitor? The answer is, no! The cat is only reacting to the visitor’s powerful new scent. Cats do not understand the human’s approach to scent. We try to erase ours by bathing, using deodorant, and washing our clothes. On the other hand, cats love their scent and faced with an overpowering scent they will add what they consider to be “good smells” onto the bad stuff — much the same way that you use an air freshener to erase foul odors. This situation can be prevented: simply ask guests to keep their door closed, their suitcase closed, and to please not leave their clothes in areas the cat has access to. And explain why. Better to be safe than sorry! 1. Clean it up: Clean up the area as quickly as possible. 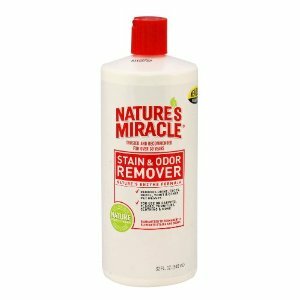 Use a specifically designed enzyme pet product that will eliminate the odor, you don’t want PIckles to think the carpet is her new litter box. In addition to a thorough clean up, spray the area with a feline specific pheromone product such as Feliway twice a day. 2. Block it: Utilize a large plastic bag and secure it over the area to prevent her from returning to it. In the case of a sofa or a bed you can use a shower-curtain liner or purchase a tarp at your local hardware store. Make certain that you secure it in place so the cat can’t move it with her paws. You can also use boxes or any other structures that will block the cat’s access to the area. Or prevent access completely by closing the door. 3. Prevent it: To calm a nervous or anxious cat (due to a move or a new cat or new routine) utilize a plug-in pheromone product or spray. 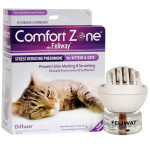 These pheromones send messages of happiness and contentment to the cat’s brain. Purchase Bach Rescue Remedy and place a drop of the essence on the skin of the inner part of each earflap four times a day. In addition, you can also mix a few drops of essence into the cat’s drinking water. 4. Stay calm: Don’t overreact or become frustrated or resort to yelling. This will only create more anxiety in the cat. Instead, try to remain calm and adopt as regular a routine as possible. 5. 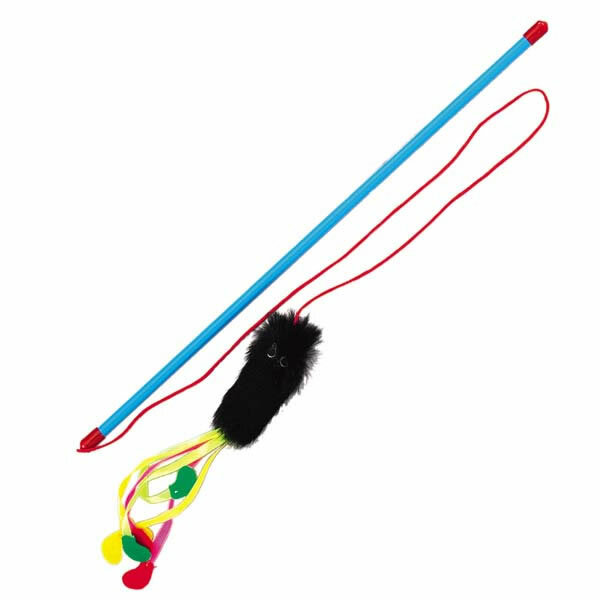 Give the cat plenty out outlets to get rid of extra energy or frustration: Providing little Pickles with a set schedule for physical activity (such as playing with cat fisher toys or strings) will give her an outlet for pent up energy and stress. It’s much like our way of taking a brisk walk when we feel frustrated or indulging in a good workout to relieve stress. Afterward, Pickles’ energy will be spent and she can relax and enjoy a good meal and a nap. Dogs are scared of fireworks and thunderstorms. It’s only natural. Loud noises trigger a powerful flight or fight response in both dogs and cats. A loud clap of thunder is likely to send them helter-skelter in search of a good hiding place. That is as it should be. After all, an animal in the wild will naturally seek refuge during stormy times or if danger is approaching. Unfortunately, more dogs escape from their homes and yards during storms and fireworks than at any other time. 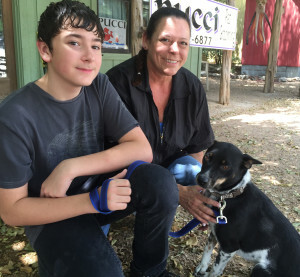 On the day after the Fourth of July county animal shelters fill up with “stray” dogs. Cats, on the other hand, are far less prone to run away from their home base. Instead, they choose to burrow into a good hiding spot inside the house or yard area. Also, it appears that suburban and country dogs are more prone to this form of noise phobia than their city cousins. 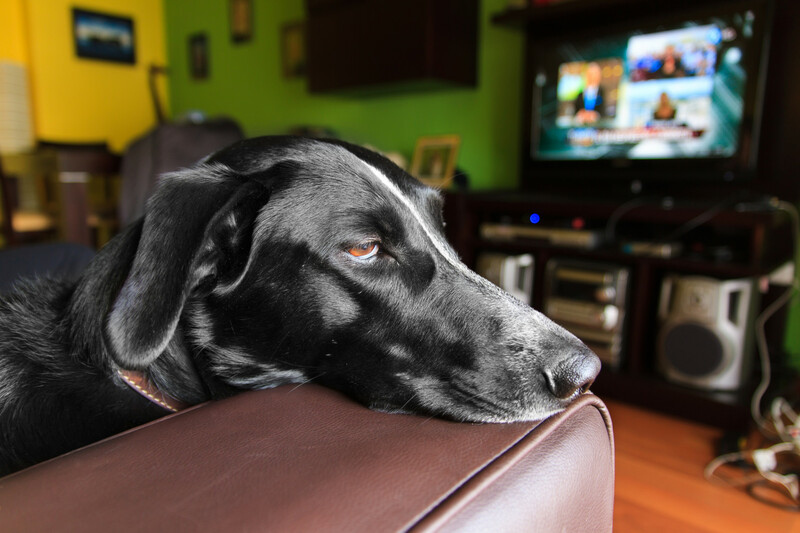 Noise phobia is not breed specific so even sporting dogs can display anxiety during fireworks or thunderstorms. 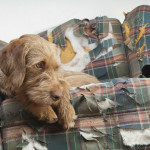 Dogs that are scared of fireworks (or thunderstorms) often have their own coping strategy such as seeking refuge in a windowless room or a bathroom or under a table. Others go into an all-out panic attack with displays of whining, howling, barking, shaking, trembling, urinating, or defecating. Some resort to chewing on furniture while others try to escape by jumping out a window or scratching their way through the door. 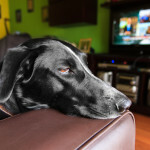 How can a pet parent help their dog overcome this type of anxiety? 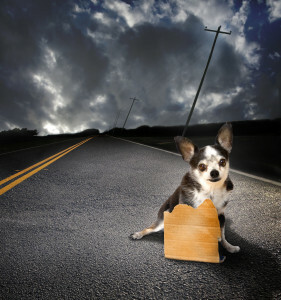 Most of the time dogs will ride out the storm and return to their normal selves again. However, do not overcompensate by feeling sorry for your dog or comforting him excessively. Comforting your dog will only give him temporary relief and it will further the anxiety the next time. Your body language and your confidence will do far more to stabilize your dog than words of sympathy. For more extreme cases, some animal behaviorists recommend reducing sensory overload created by static electricity and barometric pressure. This can be achieved by dressing your pup in a “thundershirt”, or a tightly bound T-shirt and massaging his ears. 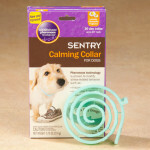 If that doesn’t work there are many products on the market designed to keep Fido calm. One behaviorist recommends buying an “appeasing pheromone” that plugs into a wall outlet, such as Comfort Zone. It emits the chemical simulation of a lactating dog and helps the dog feel safe and secure. There are also homeopathic products for anxiety such as Rescue Remedy made by Bach Flower Essences. Also, Calms Forte works well. Both are safe for dogs and there is no danger of overdosing. For Calms Forte` use the dosage recommendations for children on the product label. Give these to the dog right before a thunderstorm. The hormone Melatonin can also reduce anxiety levels in dogs and has health benefits for both dogs and humans. But, please check with your veterinarian before administering, particularly if your dog is on other types of medications. A dog’s dosage for Melatonin is .5 of 1 mg for small dogs, every 8 hours. For large dogs give 3 to 9 mg when needed. Last but not least, is a method of sound desensitization used to treat noise phobias in dogs and cats. It is a rehabilitation treatment that exposes your pet to the noises that he fears, over and over again. At first the noise levels are low, gradually increasing in intensity. Two veterinary surgeons in England have developed a highly effective program and their Sounds Scary high definition CD has produced remarkable results. The reward is a calmer more confident dog and cat. Note: The link included in this article can provide you with free downloads to help your pooch or kitty become desensitized. For other audio tracks visit this web site Scared No More. Bringing Home a New Kitten! 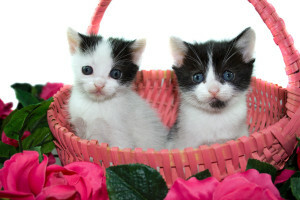 You’ve taken to the plunge to adopt a kitten! Congratulations! Now is the time to bond, enjoy and establish a relationship that will grow and remain strong as long as she lives. But, first things first! Remember bringing your kitten into a new environment could be frightening for her. She’s going to be away from all the familiar smells and sounds of her former home. She’s not going to know you yet. Best to take things slow and easy the first few days. Let her acclimate. However, before you bring her home prepare in advance. Purchase: A sturdy carrier, food and water dishes, litter box, litter (no clumping clay litter please! Kittens might eat it and cause intestinal blockage), scratching posts and bedding and toys! Interactive toys that stimulate the mind are such fun. 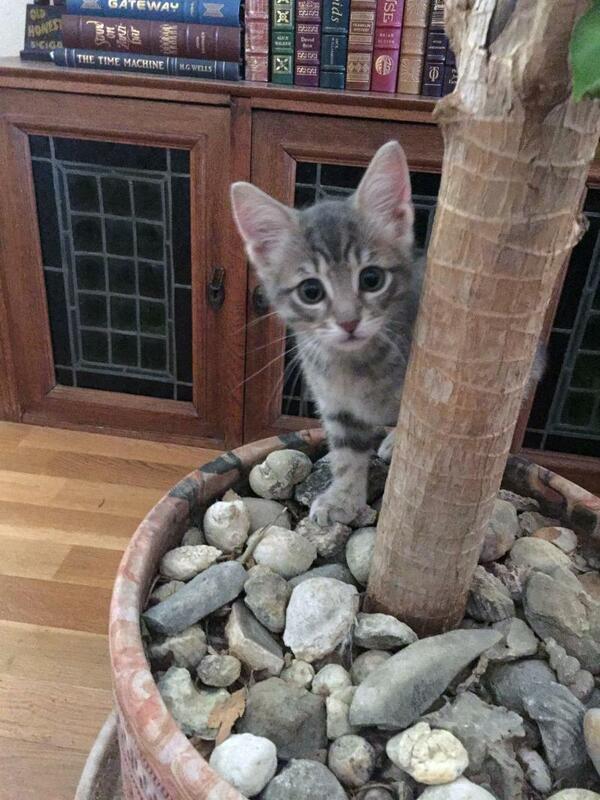 Environmental enrichment is very important at all stages of your kitten’s development. Prepare a safe space: Set up a quiet room for her, away from all the hubbub of the home. 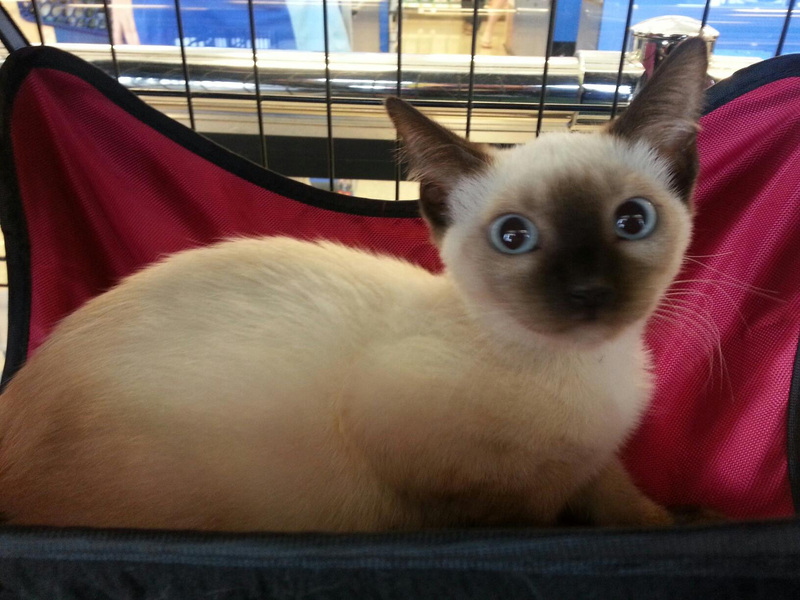 It can be overwhelming for a little kitten to be plopped down into a large, unfamiliar home. You can use a spare bedroom or bathroom. This will give her a sense of security and prevent undue stress. Include a “safe” place to hide, perhaps an upside down cardboard box with a hole cut out so she can go in there and hide. Kitten proof your home: Cover electrical cords, remove breakable items from around the home, remove strings, rubber bands and thread (kittens can eat those and cause intestinal blockage). Remove any harmful plants: If you are uncertain if a certain plant is poisonous please look this list up at the ASPCA POISON CONTROL CENTER. For example, the Sago Palm is lethal to both cats and dogs. Keep your dryer, washer and toilet lid closed. Kittens love crawling into them and exploring. Be certain that you place window blind cords up high to avoid kitten accidentally getting strangled on the cord. Remind family to be observant when opening and closing doors, cupboards, refrigerators and freezers or moving a chair. Kittens are inherently curious and will want to explore these areas. The result could be injury or death. Not all cat toys are safe! Be mindful of toys with small parts that can be eaten or create a chock hazard. While in transport, keep kitten in carrier at all times! When you get home place her (still in the carrier) into her room, open the door and allow her on her own to come out and explore. Do not force her out of the carrier. Once she comes out allow her to approach you. Don’t move towards her. Always be gentle when handling her and speak to her in a calm, soothing voice. For now, leave the carrier in the room with her, leaving the carrier door propped open. The carrier will become her temporary hiding space. 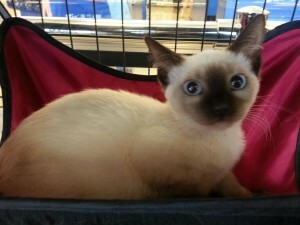 Introducing Kitten to Your Home! Never Allow Kitten to Roam Unsupervised! Even after kitten has adjusted well to her new home it isn’t a good idea to leave her unattended while you are at work, running errands or otherwise occupied. To be safe please place her into her “safe” room until you are able to observe her activity. Once kitten reaches 6 months of age, she will be well on her way to handling the challenges of your home and her (by now) familiar environment. 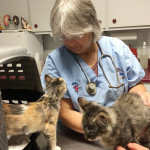 Bring Kitten to Your Vet for an Exam! It’s important for your new kitten to receive a health check up from your local veterinarian. This is crucial on many levels, she needs her kitten vaccines to stay healthy. She also needs other medical treatments such as deworming, possible nutritional supplements and it introduces the vet to your kitten. This comes in handy if an accident were to occur. Having an established relationship with your vet is important to your kitten’s future health! Last but not least! Remember to keep kitten in her safe room when you are not able to supervise her directly. Congratulations! And please! Spay! Neuter! and Microchip your pets! You added a new kitty to your family! Congratulations! Now comes the challenge of introducing your new cat to your dog. 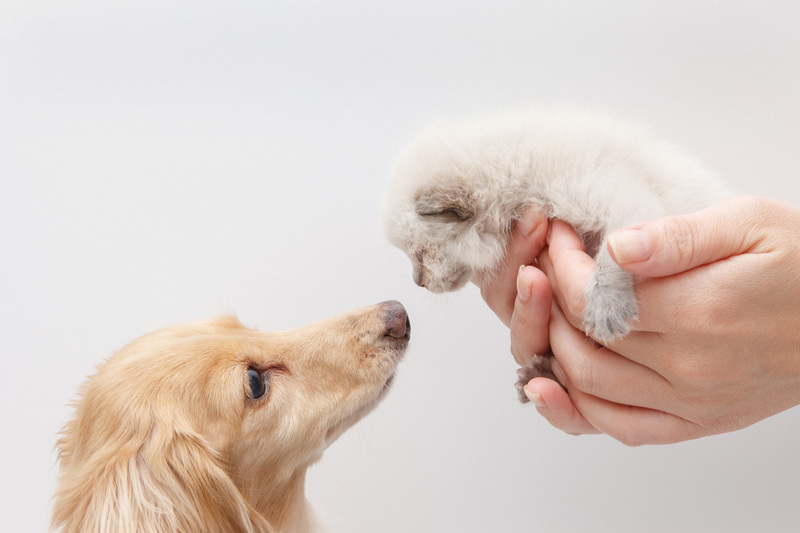 There are many factors to consider before making the new cat to current dog introduction: Is you resident dog a young pup? Is your resident dog already cat friendly? Does your resident dog have a high prey drive? Is your new kitty “dog friendly”? Is your new kitty a small kitten? Is your new kitty nervous, high-strung or generally afraid? Keep these questions in mind as you continue to read. Be patient and calm: Throughout this phase speak calmly, be generous with praise. Reinforce positive behavior with treats. Provide resident Fido special attention. You don’t want him getting jealous of new kitty. New kitty can receive special cuddles in private. Avoid scolding, speaking in a nervous voice — even if the first meeting did not go well. Baby kitten needs to be kept safe at all times! 1. 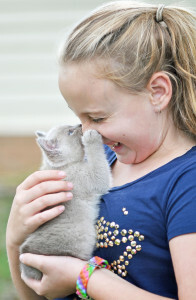 Never introduce a tiny kitten to a full grown dog or even a puppy without holding the kitten: Little kitten bones can be easily broken and internal injuries can result from a quick swat of a dog paw or worse death can result if dog grabs kitten by neck and shakes it. 2. Never leave the new kitty and dog unsupervised: A dog can kill a cat very quickly. 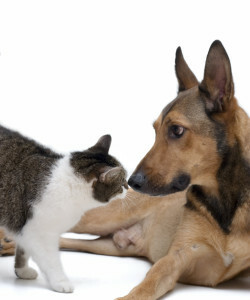 Even if you think your dog LOVES cats, be very cautious about leaving them alone together. ALWAYS give your new Kitty an escape route, something high to jump up on or a small cat door that he/she can run into (and dog can’t) to hide in safe area. First! : Give new kitty a “safe” space of her own. A small room is preferable, perhaps a half bath or even a seldom-used closet. Place kitty’s box, food, a scratching post, a comfy bed and blanket in her room. Give new kitty a chance to “decompress” in this setting for a few days before making introductions. Second! 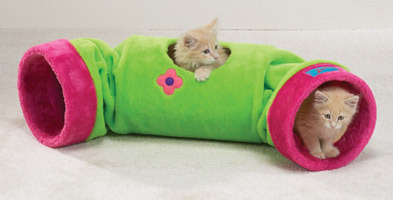 : Give new kitty a chance to explore the home (with Fido out of the way). Start with one room first and gradually expand this to other areas of the home. Give her a scratching post in one of the primary rooms of your home (living room, family room, etc.). The scratching post will help trim her claws while releasing pheromones from her paw pads. These pheromone scents will provide her tranquility. Third! : Give Fido a blanket to sleep on and in a few days swap out the blankets between the two. That is, give Fido new kitty’s blanket and give new kitty Fido’s blanket. The idea behind this is to co-mingle their scents. Scents that are familiar are far less threatening. Continue swapping the unwashed blankets back and forth over this crucial introductory phase. Fourth! 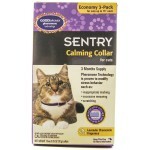 : Purchase these items to help the meeting go smoother between the two: calming collars or sprays. 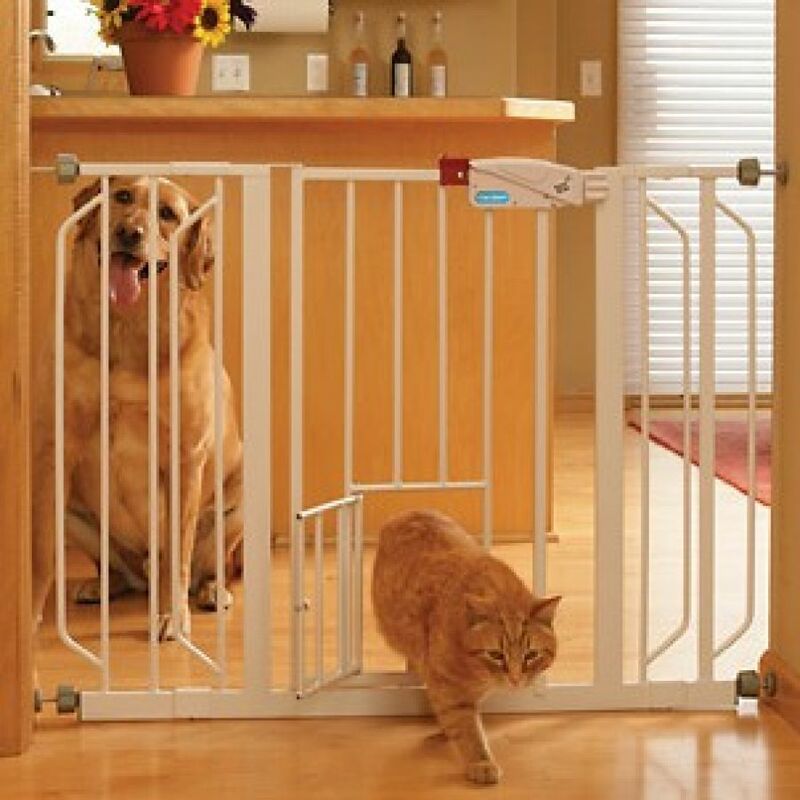 A specifically designed gate with an opening for cat to go through (to prevent Fido from following new kitty into her “safe” area). Fifth! : Set up a supervised meeting between Fido and new kitty. Let Kitty approach Fido on her own. 1. Select an area of the home where both new kitty and Fido are familiar. 2. Place a leash on Fido. 3. Do not use a leash or harness on the kitty — or anything else (such as a crate or carrier) that will cause the new kitty to feel trapped. 4. 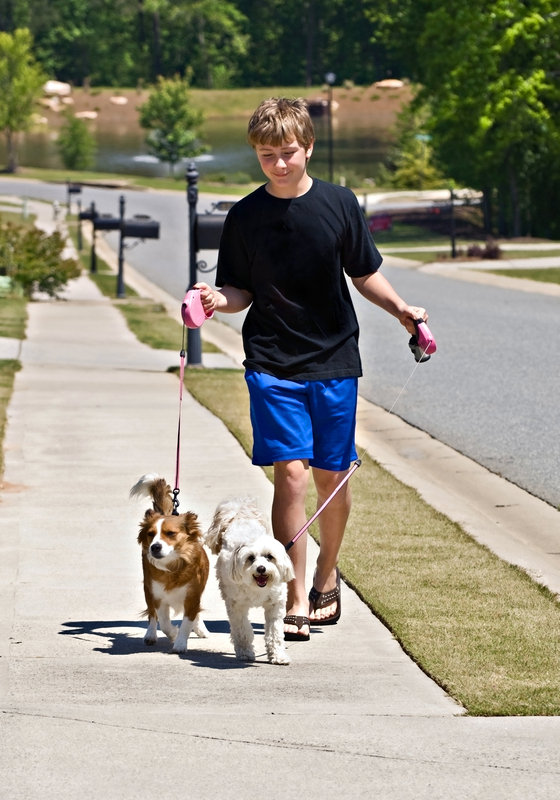 Have another member of the family or a friend hold Fido’s leash. 7. 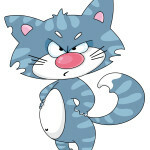 Let new kitty approach Fido if she wants to but don’t force her. 8. Keep this meeting short! After a few minutes put Fido away. 9. Let new kitty continue sniffing the area where Fido has been. Put new kitty away. 10. 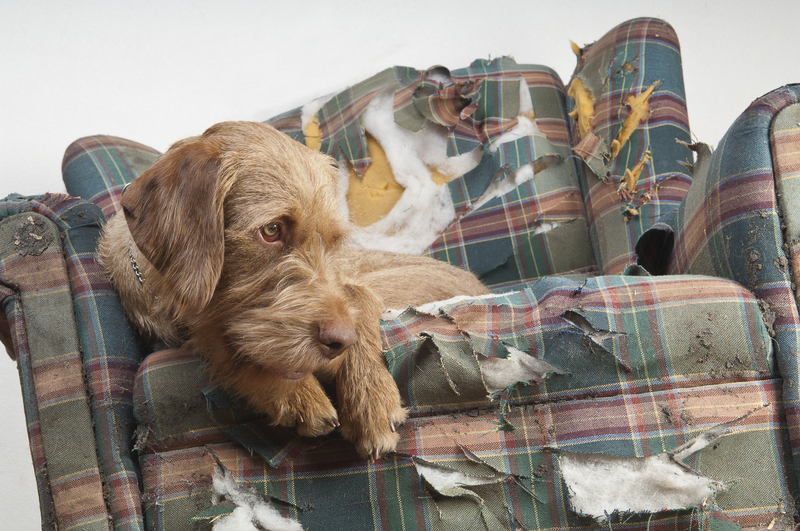 Bring Fido back into the room and allow him to sniff the area where new kitty has been. 11. Repeat this several times a day for a week (perhaps longer) or until the new kitty approaches Fido on her own. 12. Once they have touched noses, sniffed each other without incidence you can begin increasing their time together. Repeat these short visits until both Fido and new Kitty are comfortable with each other. Continue to keep a leash on Fido while they are in the same room together until you are certain they are comfortable with each others company. Always keep them separated when no one is home to supervise their interactions. A few suggestions: Separate an area for new kitty for her litter box and food. Fido will often indulge in eating kitty’s food and the litter box is a huge temptation for Fido. Place kitty’s food up on a high counter. Place litter box in a room with a propped open door (or better yet purchase a specifically designed gate that gives her access but keeps Fido out). 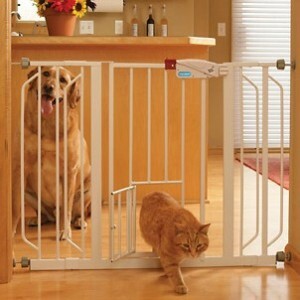 Gate with separate “cat” door keeps Fido out of kitty’s safe room. 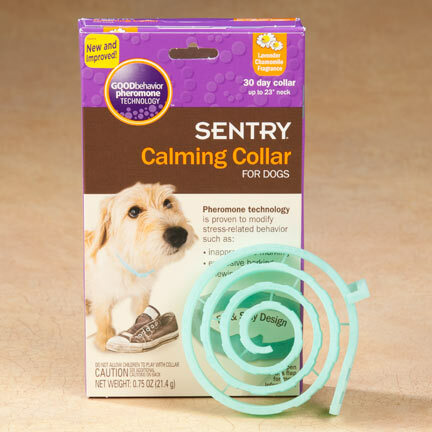 Calming collars can help introductions. Texas Animal Guardians, a small rescue organization located in the New Braunfels, Texas area, achieved a big victory in 2015. It saved 195 cat, dogs, puppies and kittens from certain death by disease, starvation or euthanasia at high kill shelters. Considering that Texas Animal Guardians is only a small group of volunteers, this number is impressive. Our goal for 2016 will be 250 lives saved! We can’t do this without the help of all our supporters. Each dog, cat, puppy and kitten costs on average $250 for routine vet care, food and medications. IF the animal is sick, injured or in need of special medical attention, that amount jumps up — often reaching over a thousand dollars. But we consider every penny spent well worth it when we see the happy looks on the faces of the families who adopt from us. For us that’s what it is all about: Bringing People and Pets Together! Naturally, we couldn’t do this alone – we have the help of strong supporters who contribute their money to help pay for expenses. AND we have the help of a great veterinarian and his staff. 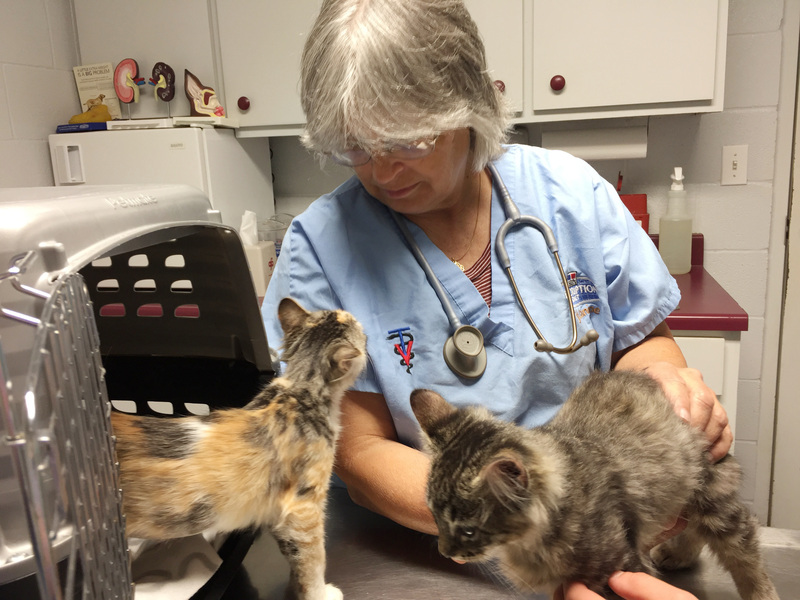 Dr. Keith Leakey of Canyon City Animal Hospital is not only on our Advisory Board but he plays an active role in the care of the animals we save. He is there to offer a guiding hand, a word of advice and exceptional medical care. Without him and the Canyon City Animal Hospital staff we would be lost. Thank you to all our supporters, volunteers, foster families — we couldn’t do it without you! Many of the animals received into our adoption program need expensive medical care. Your tax deductible contribution helps pay for this. 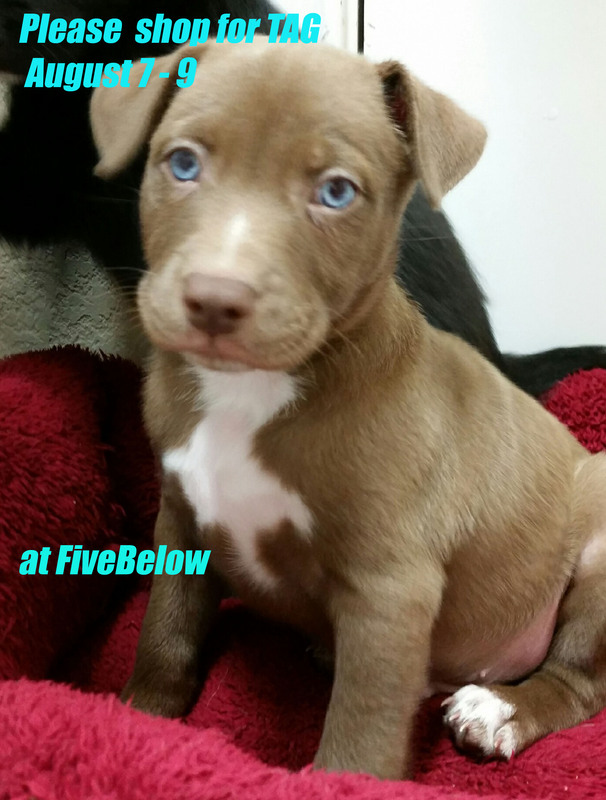 Won’t you please consider a small donation to help needy animals get well? This gives them a chance at adoption and a new life. Thank you in advance! 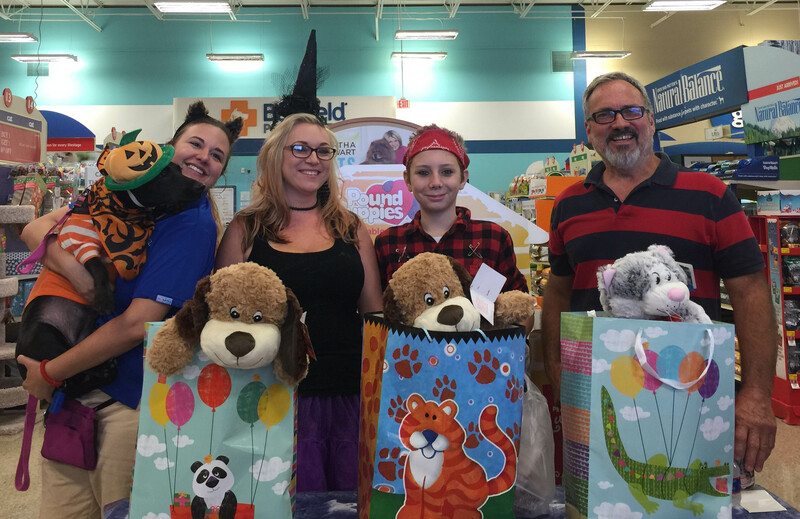 Bark-O-Ween and Fun Raiser (fundraiser) all rolled into one! Bark-O-Ween and Fundraiser (fun raiser!) — what a great combination! October 31 wasn’t the least bit scary or ghoulish! At least not at the Petsmart store in New Braunfels. 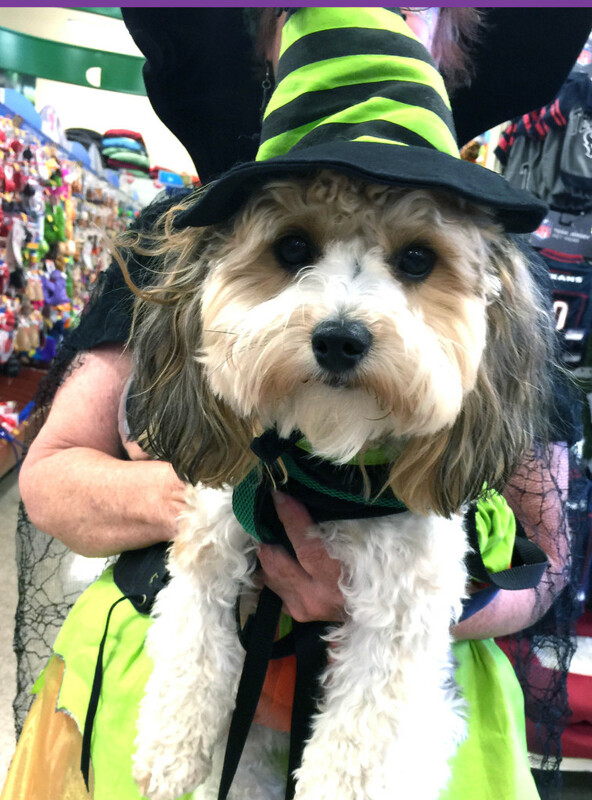 Instead of monsters, vampires and zombies there were darling fur-bearing critters bedecked in costumes at the store to celebrate the most awesome of scary days — Bark-O-Ween! Never heard of it? Well, it’s a lot like Halloween — except instead of screams you’re gonna hear a lot of barks. And these guys really DO tricks for treats! 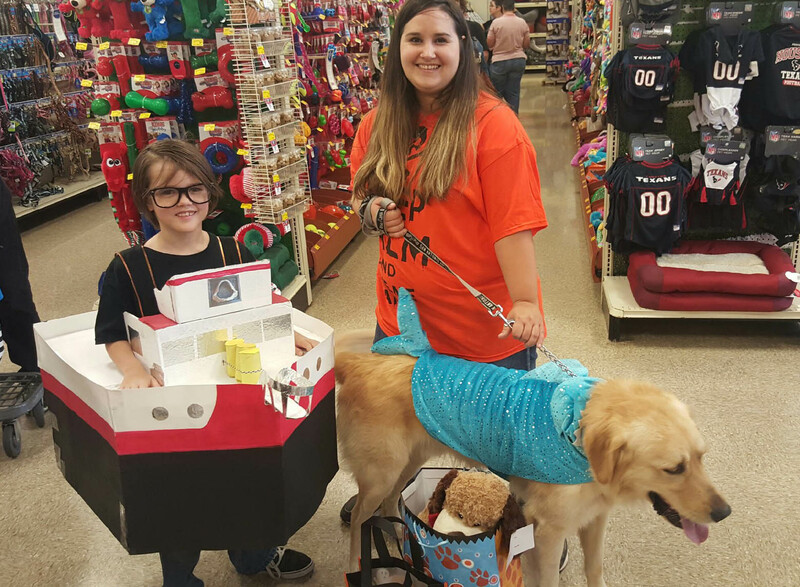 Texas Animal Guardians hosted the fun-filled Bark-O-Ween contest on October 31. There were three prizes given out: Cutest, Most Original and Scariest. The judges took their job very seriously and pondered the decision for a while. Then the great prizes were given out! These prizes, valued at over $70 each, were donated by Texas Animal Guardians (TAG) and TAG supporters. There were some mighty sweet contestants — all worthy of mention. The vote is in! 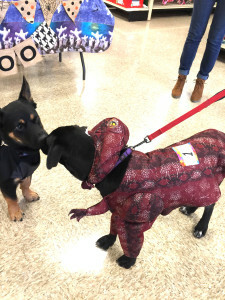 Bark-O-Ween will be an annual event! While all this hoopla was going on there were other fantastic things happening in the background (or should we say the foreground). 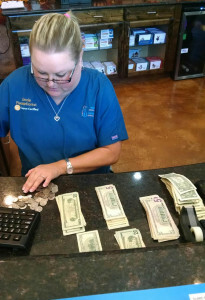 Supporters gathered together to hold fundraisers to help TAG pay down the vet bills. 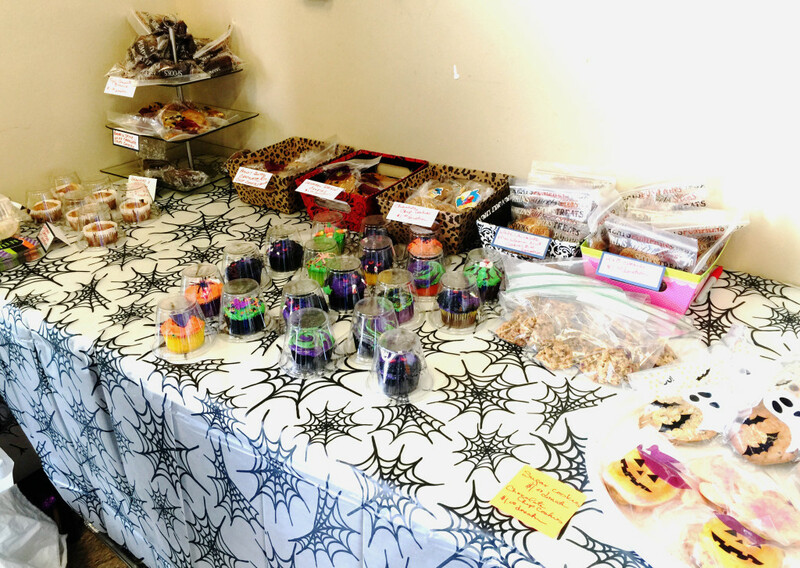 Stationed at the front of the store was Diane with her Yummy Halloween Bake Sale. Diane, a TAG supporter, showcased triple chocolate brownies, lemon pudding cake (a HUGE hit), and cookies and cupcakes of all kind. All baked goods were hand-crafted, all were beyond delicious and all a HUGE hit. That sale raised over $600 in two days! Then there was the Add Some Sparkle to your Life! hosted by Almut, another Texas Animal Guardians supporter. The sale featured brand new, precious metal and gemstone jewelry. It added an additional $200 to the total. Earlier in the month, Kim another fantastic TAG supporter, raised an additional $100 at the Austin City Limits festival. All totaled TAG raised over $900 to pay down vet bills. We couldn’t be happier! And so very thankful to all our supporters and volunteers who made this possible. 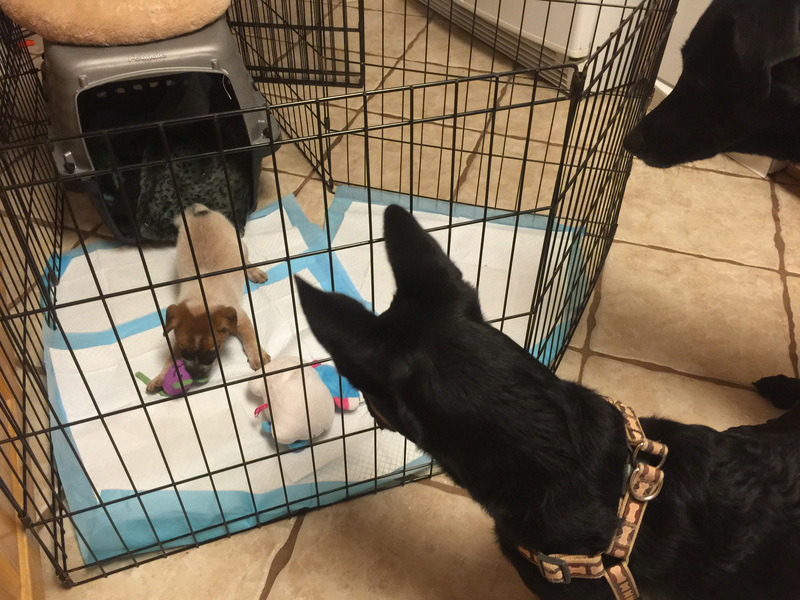 Why Should You Crate Train? Crate training is necessary for many reasons. It limits the dog’s access to areas of the home until she learns the rules. It prevents her from chewing up your furniture or eliminating inside the home. It keeps her safe while you are absent. With the proper introduction and training your dog will accept the crate as a safe place. Please keep in mind that the crate is not a place of punishment or extended confinement. Crate training is an intermediate phase for a dog. In other words, once the dog has reached maturity and is completely house trained, past the puppy chewing phase and fully trust worthy in the home the crate will be phased out completely. What Type of Crate Should You Use? By far the best type of crate is the wire type. Plastic and fabric crates can be chewed through. Choose a crate large enough for the dog to stand up and turn around in. In addition to the crate, purchase spill proof bowls that can attach to the crate (for later). Once your dog is acclimated to the crate these bowls will provide fresh water or food during your absence. The length of time to acclimate your dog to the crate can be as short as a few days or as long as a few months. A lot depends on your dog’s previous experiences with being confined in a small space. Puppies are generally easy to crate train, mainly because they haven’t developed issues with small spaces. This is why it’s advisable to crate a puppy from an early age to acclimate them to the crate. Adult dogs can be more of a challenge. For this reason, the training process listed in this article will be focused on adult dogs or puppies over the age of 5 months, not young puppies. 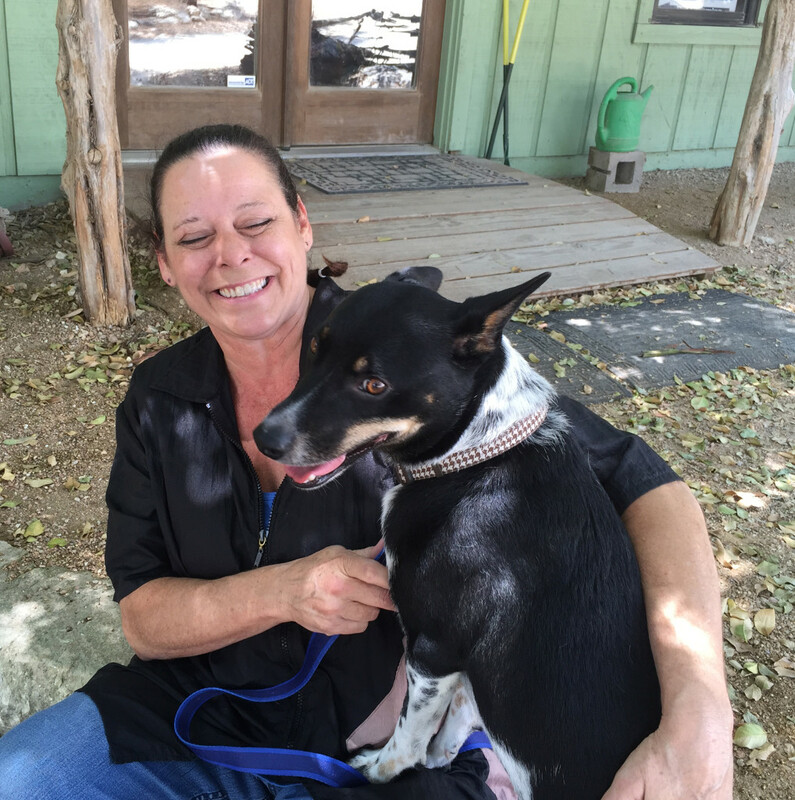 Texas Animal Guardians receives a number of adult dogs and puppies from a variety of backgrounds into its adoption program. The first step towards helping them transition from the shelter to a home is crate training. Many dogs develop phobias surrounding confinement and being shut up inside a shelter doesn’t help. Humans react the same way to being locked up. It really isn’t pleasant to be confined in a small space with no escape route. Not to mention there is no outside stimulation or companionship. 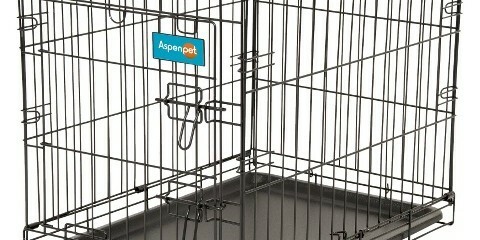 This is why the crate must only be used as a temporary tool during a dog’s adjustment phase when entering a new home. 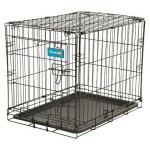 First, set the crate up and place it in an area of the home where the dog can see you and/or other family members. The last thing you want to do is make him feel isolated. Next, secure the crate door into an open position with a bungee cord or some other fastener to prevent it from accidentally closing. You don’t want him to get freaked out by a crate door closing on him. Then put some favorite toys and a chew bone inside the crate. Hopefully you have already the article Helping your Rescue Dog Bond and Adjust — if not please do. This process is a reward-based one. It involves lots of praise and treats. The same applies to crate training. In the case of an extremely fearful dog, just take your time. Place all feeding bowls by the crate, not inside. Initially, every feeding will occur outside the crate, but next to the crate’s door. You will place yummy treats inside the crate. When he enters the crate to grab a treat, praise him. Always sit nearby while your dog is becoming acquainted with the crate. 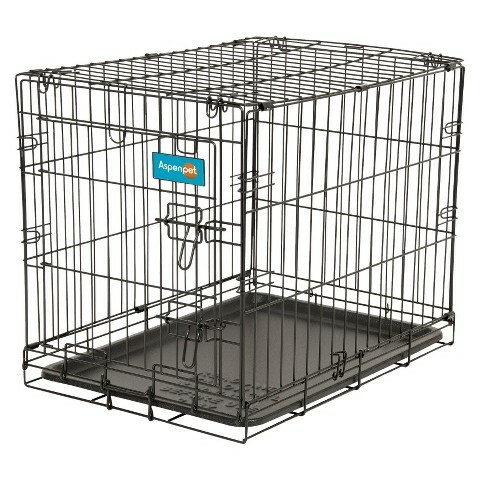 As your dog’s comfort level increases, slowly begin trying to feed him inside the crate. Place the food bowl and his water bowl at the front of the crate first. Gradually begin to place the bowls further and further towards the back of the crate. Once your dog has adjusted to receiving feedings and treats inside the crate, begin closing the crate door while he eats. Do NOT leave him. Stay with him and immediately open the door again, give him a treat inside the crate and using your “happy” voice praise him. Continue doing this over and over again (as many times as possible each day) for the next few days until he becomes comfortable being in the crate with door closed. At this point the next phase will begin. This phase involves leaving him for short periods of time. Feed him inside the crate, put a nice chewy toy in it. When you place the treat or food inside the crate use a voice command such as “kennel up” for him to associate with the action. Close the door and leave the area for a few minutes and return. Open the door and praise him in your happy voice and let him back out. Continue this exercise several times a day, over the next few days. You can repeat this exercise by using treats, a filled chewy toy or a new toy — anything to distract him (see note below). Always use the same voice command each time. Gradually increase the length of time you leave him. Always return with treats and praise. After your dog is comfortable being left in the crate for about 30 minutes without developing anxiety, you can being to crate him for short periods while you leave the house. Put him in the crate using the voice command, such as “kennel up”. Place treats and toys in the crate for him. Keep departures and arrivals low key. Be matter of fact about it. Continue to crate him for short periods of time while you are home. Vary your patterns for getting ready to leave by placing him in the crate 5 to 10 minutes prior to leaving. This period of conditioning can take a few days or a few weeks. It’s always a good idea to give your dog some type of safe chewy toy to keep him occupied inside the crate during this time. Kong makes a good one that you can fill with all kinds of yummy stuff such as peanut butter, cream cheese or even ground style dog food. You can place the stuffed Kong in the freezer and it’ll give him something to occupy his mind with when you leave the room. The crate IS NOT a cure for separation anxiety! Any dog that exhibits this type of behavior will need further counter-conditioning. An anxious dog can and will injure itself by trying to claw its way out of the crate, chew through the metal (and break a tooth) or panic to the point of salivating. DO NOT confine your dog or puppy for over 6 hours in a 24-hour period of time. Confinement in a small space for extended periods of time is not natural, normal or desirable for a dog or, for that matter, a human. Consider what the consequences are: neurotic behavior, anxiety, space sharing issues and aggression. If you are tempted to crate a dog for extended periods of time you could actually create aggressive behavior in your dog. The dog will view the crate as its domain and react aggressively towards anyone approaching it. 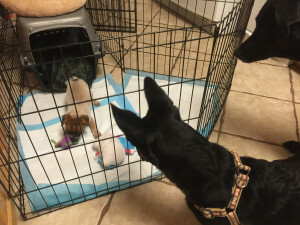 A crate confined dog will develop resource guarding behavior and it will not be well socialized. Rio: How one Dog Won a Forever Home! On June 11, 2012 Texas Animal Guardians pulled six puppies from a small shelter outside Lockhart, Texas. Among them, a sweet terrier mix named Lakota. There were approximately 12 puppies in that kennel. Lack of foster space prevented us from removing all of them. Sadly, that left many innocents behind, including Lakota’s twin brother, Rio. Lakota visited Pucci Grooming Salon in Wimberley where owner Jessica saw him and fell in love with him. She wanted to adopt him for her son’s 8th birthday. But Lakota was already spoken for. Jessica was assured that Rio, his twin, was still at the shelter waiting. And, now that Lakota was leaving there was space for Rio. By this time, it was July 30, 2012—Rio had been waiting a long time. On August 2, 2012 TAG set out to pull the rest of the pups left behind. 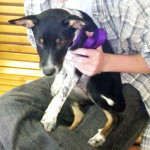 Sadly, Parvo reared its ugly head and tore through the exact kennel Rio was housed in. All the pups were slated for immediate euthanasia. Now that TAG was finally able to get him and the others out, it appeared hopeless. Thankfully TAG works with a fantastic group of veterinarians at the Canyon City Animal Hospital. They agreed to place Rio in isolation for 14 days. With that assurance, the shelter allowed TAG to pull Rio. The days ticked by slowly, dragging on and on. Rio was shut up, with no more than necessary contact. He howled, he cried, he was totally miserable. Fourteen days were up. No Parvo! At last, his release day arrived. BUT this experience had taken its toll on the now 4 ½ month old pup. He was already shy, now he was fearful. He couldn’t stand to be left alone. It took a lot of behavior modification work to help him through this. Thankfully Rio rallied and eventually became a helper with other fosters who had issues—a self-appointed therapy dog to other dogs. By now, it’s September and Jessica’s circumstances had changed. She adored Rio but adopting a puppy was no longer an option. Rio was adopted out twice, each time it failed. He just appeared miserable without his foster family and the dog pack he’d grown accustomed to. After two failed adoptions, Rio was removed from the available adoption list. He became a permanent foster. Rio had a home with his foster family, as long as he needed it. Throughout the years Rio was a regular at Jessica’s grooming salon. All of them loved him there. Then, almost three years to the date, Rio entered the salon with his foster pack for their regular “spiff up and groom.” On that day, Jessica approached Rio’s foster with a question, “Would you consider giving him up?” And with that question everything changed for Rio. He was going to enter the family he’d always been intended for. This time, it was going to stick! Rio with the family he was always intended for. 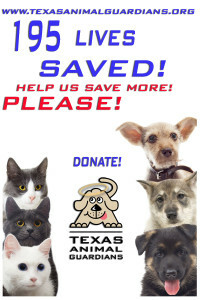 Tax-Free Back to School Shopping Event Fundraiser to benefit Texas Animal Guardians. You are invited to a Fundraising Back-to-School Shopping Event for Texas Animal Guardians sponsored by FiveBelow ! It’s simple! 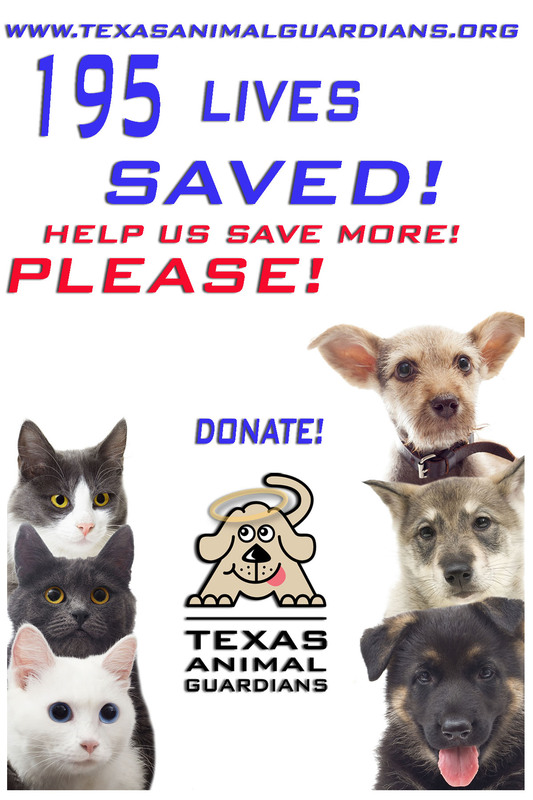 10% of the purchases made by supporters of Texas Animal Guardians will be donated to Texas Animal Guardians! 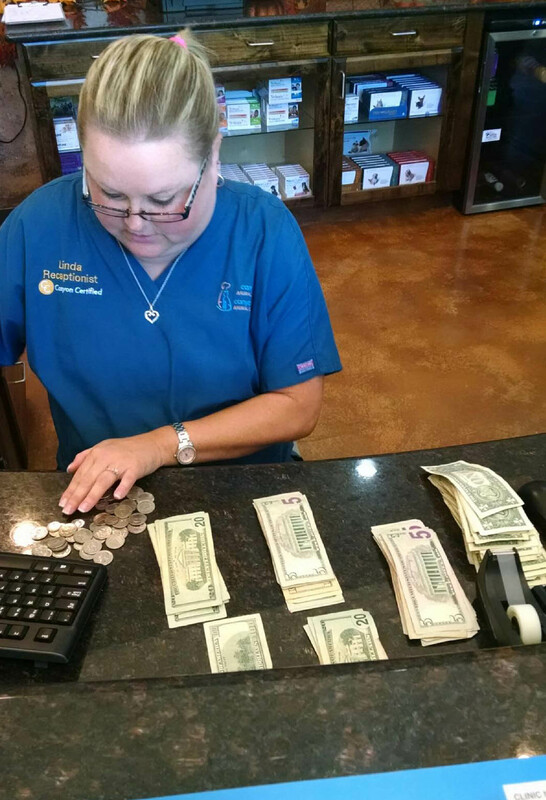 This fundraising money is slated to help build a much needed kennel facility at our Wimberley doggie ranch. How can you participate in this fundraising event? It’s easy! Just print out this flyer and present it to the cashier at FiveBelow at the time of your purchase. This is tax-free weekend for all your back-to-school needs! Click on the link, wait for PDF to show in browser window, print out the flyer, present to cashier! Why not shop great prices and save on sales tax, while participating in a once-a-year fundraising event to support a local charity? After all, FiveBelow has great prices, great selections and is a perfect one-stop shopping for back-to-school supplies. So why not do what you normally would do anyway? Shop! Save $$$ and at the same time have your purchases work for you as a donation that will continue to give? Happy Shopping! AND thank you in advance!